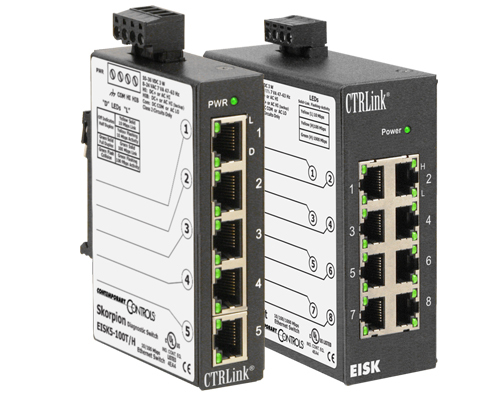 Skorpion Diagnostic Switches assist the user in troubleshooting Ethernet networks by allowing a network sniffer such as Wireshark® to attach to an unused port on the switch and observe all traffic on the network. Skorpion Diagnostic Switches retain all the features of an unmanaged switch but perform like a repeating hub where all received messages are flooded to all other ports. There are two 5-port diagnostic switches in the series which differ only by the highest data rate supported. The EISK5-100T/H supports 10/100 Mbps networks while the EISK5-GT/H can additionally support gigabit speed. The EISK8-GT/H supports up to eight ports at 10/100/1000 Mbps speeds. One benefit of switched Ethernet technology is that the switch restricts directed messages to only those ports party to the communication. This improves overall network throughput by not burdening end stations with useless traffic. However, this feature makes protocol debugging difficult because a sniffer (protocol analyser) tool attached to an unused port on the switch cannot observe any directed messages of interest. In the past, the solution was to change out the switching hub with a repeating hub but with the Skorpion Diagnostic Switch this is unnecessary. The Skorpion Diagnostic Switch retains all the virtues of switched Ethernet technology such as variable data rates on individual segments, auto-negotiation, Auto-MDIX but with one exception-no address learning. All messages-directed, multicast, and broadcast-are flooded to all ports on the switch allowing a sniffer or protocol analyser tool such as Wireshark the ability to observe all traffic on the network. The Skorpion Diagnostic Switch can be permanently installed on an installation or replaced with a regular Skorpion switch once a system is commissioned. This device can also be useful when developing embedded Ethernet devices because you can connect the Skorpion Diagnostic Switch between two embedded Ethernet devices and view their messages using Wireshark®. The Skorpion Diagnostic Switch can be used for control panel installations where one needs the ability to diagnose problems in the field. It can also be used in a development environment when debugging code. A metal DIN-rail clip attached to the aluminum enclosure can survive the toughest installation. A writable side label allows the installer an opportunity to document field cabling locations right on the unit. The Skorpion Diagnostic Switch is powered from either a 24 VAC ±10% or 10-36 VDC source. With redundant power connections, a backup power scheme can be supported. A removable power connector facilitates the servicing of the unit. LEDs built into the RJ-45 connector indicate data rate and activity on each of the five ports. For each port, the data rate will be indicated along with port activity-thereby greatly assisting in troubleshooting connection issues. The Skorpion Diagnostic Switch is UL 508 Listed and c-UL Listed for Industrial Control Equipment. It complies with CFR 47 Part 15 Class A, and carries the CE Mark. It is RoHS compliant.